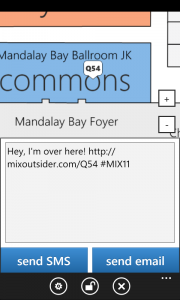 UPDATE (4/9/2011) : MIX Outsider has been updated to fix some “no network” issues and refine the message creation. MIX11 Outsider is the MIX11 app that doesn’t care about your schedule. It cares about something more important: the people you want to talk to, meet, or otherwise hang out with at MIX. 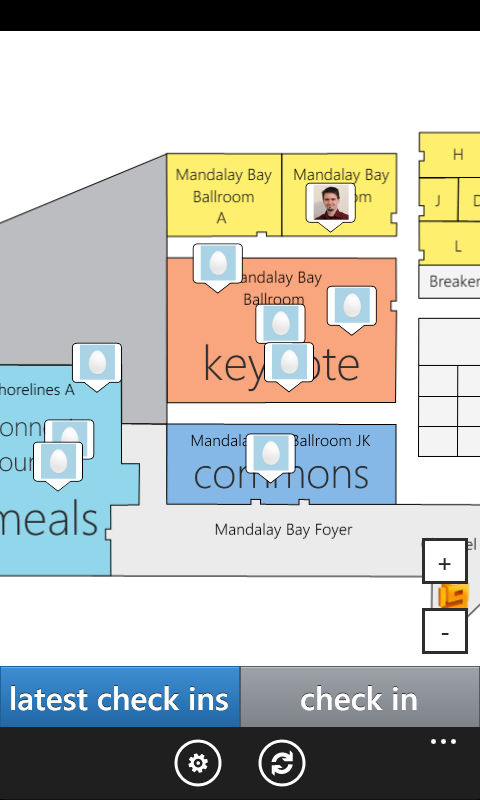 Using a map of the conference floor and a simple “battleship” mapping metaphor, you can tweet, email or text your position at the conference. Don’t eat alone in awkward silence… instead find that Twitter friend who doesn’t have a clear picture of themselves in their avatar. Don’t spend half your pre-keynote time waving your hands in the air. Just tap where you are on the map and send out a link like this one. 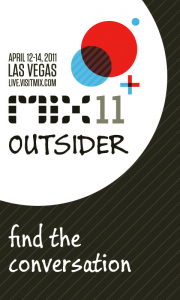 MIX11 Outsider Windows Phone 7 App Screencast from Matthias Shapiro on Vimeo. The funniest thing is that the “big idea” in this app isn’t really even the app itself. The app is really just the most complete extension of the original idea. Unfortunately, my GPS did not work very well inside the conference… which didn’t really matter since (I assume) no one wants to open up a Google Maps or Bing Maps to find people inside a building. 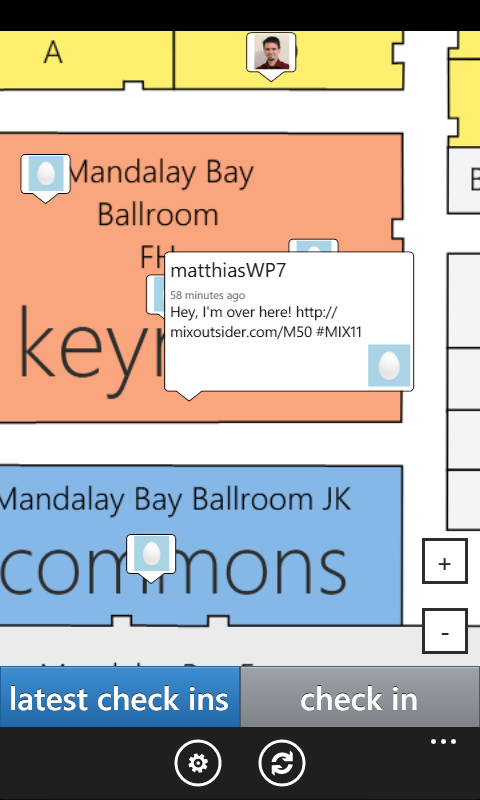 So Jason Alderman and I discussed the problem and thought that it might be fun to do a “Battleship” metaphor for finding people at MIX11, laying the grid on a map of the conference floor. 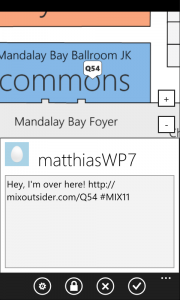 Based on that concept, I wrote a little application that allows user to tap to see where they are and send that information out. It then collects all the messages sent out with the app and shows them on the map with the users’ twitter avatars. Users can send public messages using Twitter or private messages via text message or e-mail. Private messages are not broadcast and cannot be seen by anyone. They contain only the helpful link to the MIX Outsider reference website (designed by the aforementioned Jason Alderman) without any identifying information. 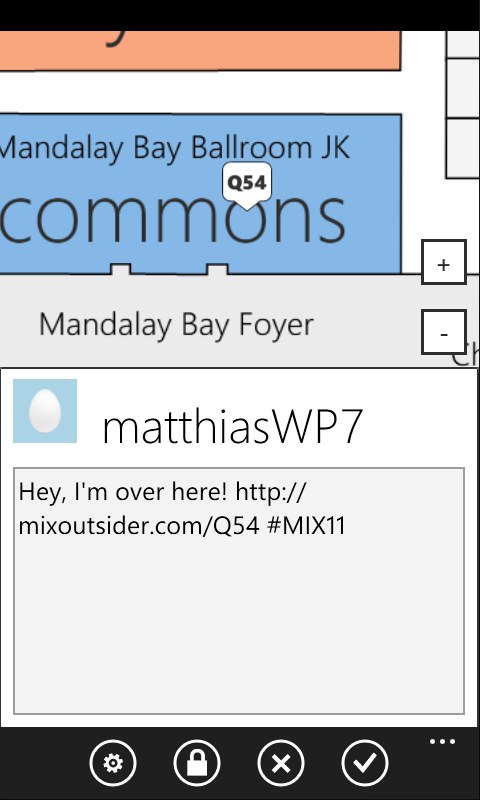 But my biggest hope is that this application gives people a point of reference so that even people who don’t have a Windows Phone 7 device can see the tweets, reference the website and still find the people they want to meet at MIX11. This entry was posted in MIX11, Windows Phone 7 and tagged MIX 11, MIX11, MIX11 Outsider, Silverlight, Windows Phone 7, WP7. Bookmark the permalink. Fantastic app, you should look into using MonoTouch and MonoDroid to target the other two platforms a little easier than going with other languages. I’ll be at Mix11 so try and track me down. Great application and showcase. See you at Mix11. Let’s sync up at the conference. Are you doing a session this year as well? This would be an incredible platform for any conference. 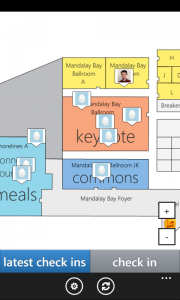 Hoping to see the ability for anyone to submit conference floorplans and get them in it. Looking into building a Android and iPhone version and just plopping new maps into it for new conferences. Nice! If you combine this with tagged photos on Flickr to help explain where and what coordinates such as U15 and R21 look like, that would be really cool. Like cool as in “good” and not “cold”, cool. Great idea. 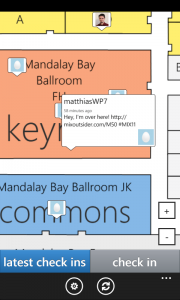 Could even be usefull for other conferences too. 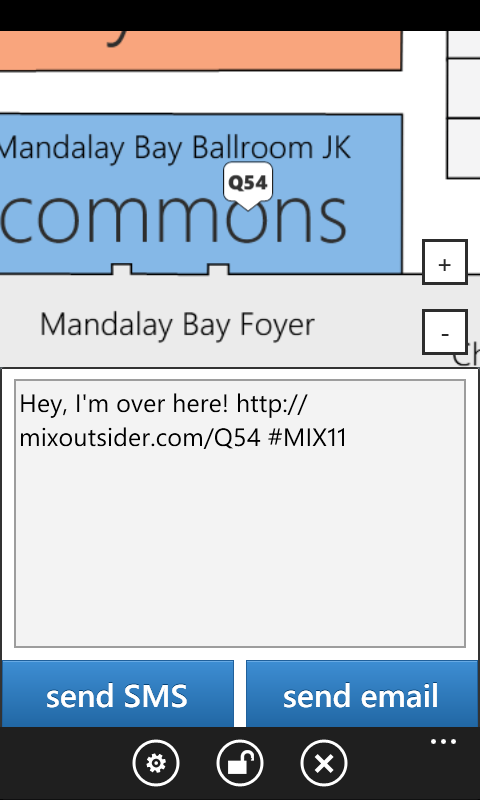 If I could attend MIX this year, I would use this for sure.